"This delicious bolognese is extremely quick and easy to make. Serve over pasta, rice, couscous, or any other carbohydrate food you fancy. This sauce gets better the longer it simmers. If you do allow it to simmer for a longer time, check regularly and add water as needed. 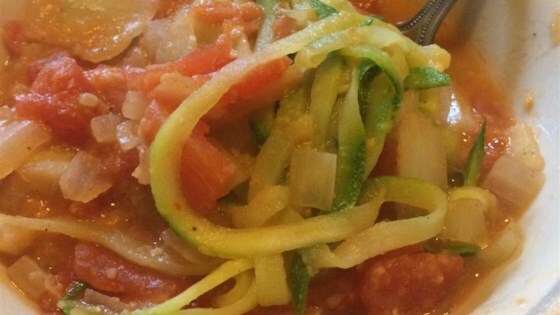 This sauce also lends itself beautifully to adding vegetables such as zucchini, eggplant, carrots, and mushrooms." Rinse lentils under cold running water and drain. Place the water and lentils in a saucepan over medium heat and bring to a boil. Cover, reduce heat to medium-low, and simmer until lentils just begin to soften, about 20 minutes. Stir the tomatoes and onions into the lentils; bring to a gentle simmer. Crumble the bouillon cube into the lentil mixture and stir until it's dissolved. Simmer for about 5 minutes more, stirring frequently. Season with salt and pepper to taste. A good base, but definitely needed a little more in the way of flavor. I personally ended up adding some mushrooms, spinach, dried basil, and fennel seeds. five stars for easy & healthy! I found the taste too bland so added 2 cubes of veg. bouillon, 1 tsp Italian seasoning and a dash of Worcestershire sauce.